When Apple first launched it’s iAD mobile advertising platform just about a year ago, it was clearly a premium price product, with Apple reportedly asking a minimum one million dollars for brands that wanted to advertise. Now things have changed, and according to recent reports in Bloomberg, Apple has radically revamped their pricing. The original price of $1million did not initially seem to be a barrier to advertisers, with major names such as Walt Disney, Citigroup, Nissan, AT&T, Unilever, Target, and Best Buy being some of the early adopters. Apple claims to have launched more than 100 campaigns in 7 countries in their first year of operation. However, iAD can only serve ads to devices that run the iOS platform from Apple, and so they miss a large and growing sector of the consumer base. Especially as the Android platform grows and less expensive smartphones proliferate, there is an ever expanding base of non-iOS consumers. So Apple has taken moves to make the platform more competitive. In the area of pricing, Apple has cut the minimum ad purchase from $1 million to $500,000, and it’s offering agencies deals for as low as $300,000 if they bring together multiple campaigns, Bloomberg reported. According to one industry insider, “Apple’s closed ecosystem may have been interesting in the short run for advertisers, but in the long run they priced themselves out,” said Thom Kennon, senior vice president of strategy for the Young & Rubicam ad agency in New York. 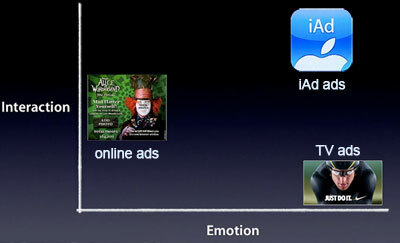 In addition, an early requirment for iAD was that Apple had to be involved with the production of the ad. Several months ago Apple launched iAD Producer, an online design product intended to help agencies design ads more quickly.